The corals of Careless Reef, set in the open waters of the Red Sea about an hour from Hurghada, are flourishing again as it recovers from the crown-of-thorns seastar’s predation. With excellent visibility, shallow pinnacles, and a steep wall with caves and overhangs, it offers something for every diver, including the chance of big pelagics. There’s no levy to dive Careless Reef, which is always visited on a dive boat operated by one of the Hurghada dive schools. As the site is exposed, it can be difficult or indeed impossible to dive on windy days, so operators may not wish to commit to a trip until they’ve seen how conditions are on the day. Careless Reef is suited to qualified scuba divers of all levels. Most dive packages include two dives, equipment, dive guide, and food and nonalcoholic drinks during a surface interval on the boat. The water can be surprisingly cold during the Egyptian winter. Consider bringing at least a rash top or, ideally, a hooded wetsuit base layer to wear under your rental wetsuit. While a number of operators in Hurghada offer accessible scuba diving, dive boats are not wheelchair friendly. Careless Reef occupies an underwater seamount (shoal) in the middle of the Red Sea about an hour’s boat ride to the northeast of downtown Hurghada. As such, your only means of getting there is to book a dive package with a Hurghada scuba operator or charter your own boat. Careless Reef is rarely crowded. As with other Red Sea dive sites, visibility is good year-round, but water and air temperature vary significantly over the year. October and November offer a particular sweet spot, with the water temperature still warm but the air temperature more manageable than during the baking Egyptian summer. 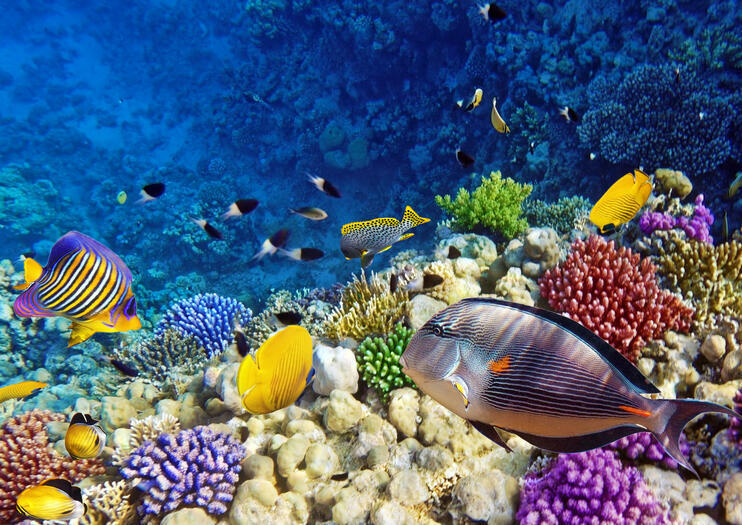 Besides the beach, Hurghada’s main attractions are underwater, and while much of the reef close to the shore is degraded, there are a number of magical dive sites farther out. In addition to Careless Reef, popular destinations include Stingray Station, Shedwan Island, and a wealth of Giftun Islands dive sites.